So far I've looked at the pinks, reds and purples in my collection, now it's time to take a look at the colours that I don't quite have as many of. To be honest I was quite surprised to find so many blacks and blues as I'm really not keen on nail varnishes in these colours. What I appear to have discovered while doing these posts is that I don't actually know my collection very well, so it's a good job we're getting better acquainted! This came as part of the Bling it on denim and studs set which I won in a competition on the Look Fantastic website. This was only available in this set but you can now buy this as just a nail varnish on its own. This is very similar to OPI's liquid sand effect. Due to the effect you can't wear a top coat over this which unfortunately means this lasts no time at all. When I tried this out for my review I'd only had this on for maybe a couple of hours and a large chuck chipped off my thumb nail. I would possibly wear this to go out somewhere if I wanted something a bit different but I wouldn't use this if I wanted my nail varnish to last for any amount of time. 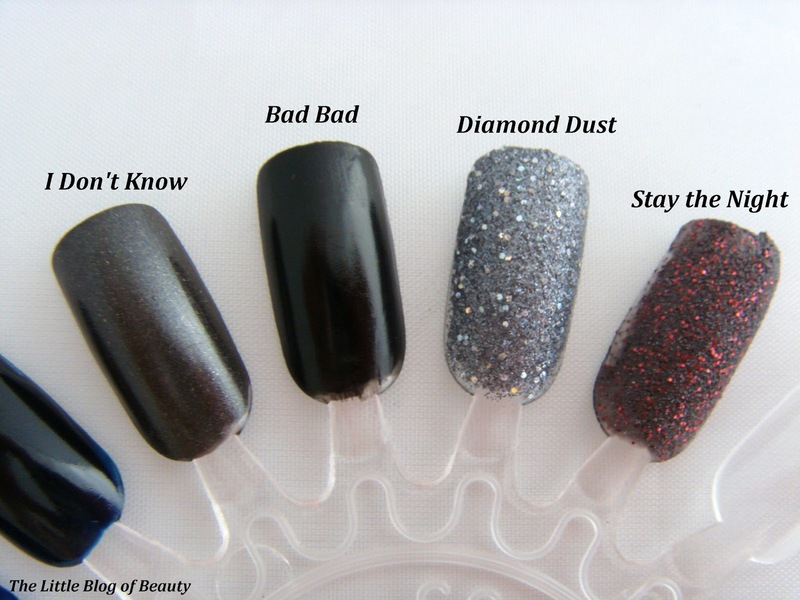 Talking of OPI's liquid sand, this is one of them! The liquid sand shades do actually last longer than Bermondsey and if I remember correctly they actually last quite well. Although I'm not a fan of blues I quite like this one because it's a lighter shade and a bit unusual. Earlier this year I won a blog competition where the prize was an Essie nail varnish shade of your choice. I was very new to Essie at the time and didn't really know any of their shades so I took to the Debenhams website and picked what I thought looked like a pretty purple colour. When it arrived I was disappointed to find that as far as I can see it's a navy blue shade, which is a nice enough colour but I don't tend to use really dark nail varnish shades unless they're a dark red/plum/burgundy colour. I find many swatches on websites are not very good so I now make sure I check out pictures on Google or Pinterest for a better idea of what the shade may actually look like. If you've read my previous collection posts you'll know I inherited a number of Barry M nail varnishes and this is another one of them. This is another navy blue shade but is much lighter than No More Film. This is another one of my Nails Inc shades that came courtesy of being free with Glamour magazine. This is a dark navy blue shade that is virtually black but you can just see at the bottom of the nail wheel swatch that it is a navy blue. I'm not really sure why I got this one; yes it was an £11 nail varnish free with a £2 magazine but as I've said I don't really like dark nail varnish shades. I guess I got carried away in the whole it being free thing! This came as part of a prize package from a blog giveaway and to be honest I don't really know anything at all about W7 at all, I'm not even sure where you can buy these from. I actually quite like this one as although it's black it has a nice silver shimmer running through it which really lightens it up and I can see me wearing this in winter. This came from the goody bag I received when I went to see The Lady Boys of Bangkok as a blogger. This one is a pure black and is the only one I have so I use this for nail art as a base. This is one my boyfriend bought me for Christmas. This is a glitter nail varnish which I don't think is actually quite black, more of a light black or grey but this also contains white holographic glitter that gives it the sparkling diamond type effect. I really like this, but unfortunately it's a glitter varnish so I don't use it very often as it's a nightmare to get off again. This is a quite an unusual one because it's a liquid sand and also black but with red glitter in it. I do like this but it kind of makes me think of molten lava! So those are my blacks and blues. 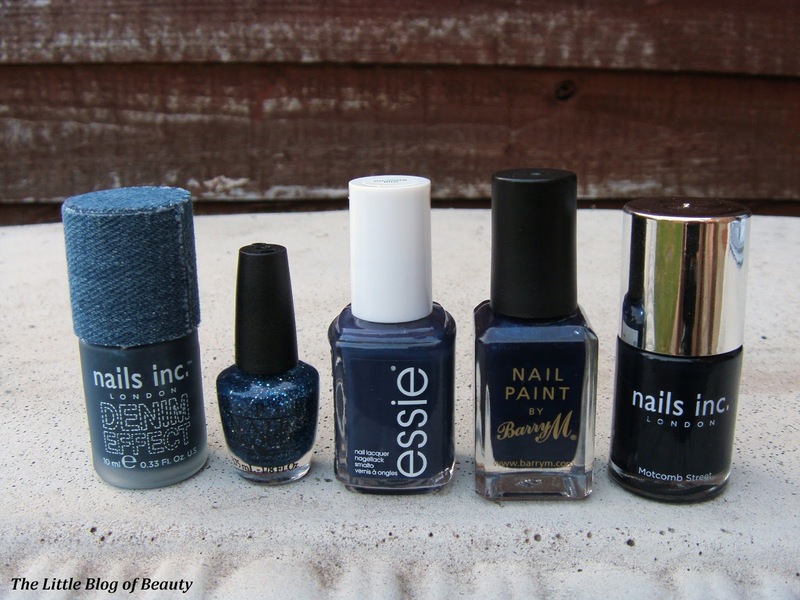 What do you think of black and blue nail varnishes? I like the denim colors and I think black looks beautiful but I don't really see myself wearing it!